"Drug delivery is a really substantial hurdle that needs to be overcome," says James Dahlman, a former MIT graduate student who is now an assistant professor at Georgia Tech and the study's lead author. "Regardless of their biological mechanisms of action, all genetic therapies need safe and specific drug delivery to the tissue you want to target." "It could be used to identify a nanoparticle that goes to a certain place, and with that information we could then develop the nanoparticle with a specific payload in mind," says Daniel Anderson, an associate professor in MIT's Department of Chemical Engineering and a member of MIT's Koch Institute for Integrative Cancer Research and Institute for Medical Engineering and Science (IMES). The paper's senior authors are Anderson; Robert Langer, the David H. Koch Institute Professor at MIT and a member of the Koch Institute; and Eric Wang, a professor at the University of Florida. Other authors are graduate student Kevin Kauffman, recent MIT graduates Yiping Xing and Chloe Dlott, MIT undergraduate Taylor Shaw, and Koch Institute technical assistant Faryal Mir. 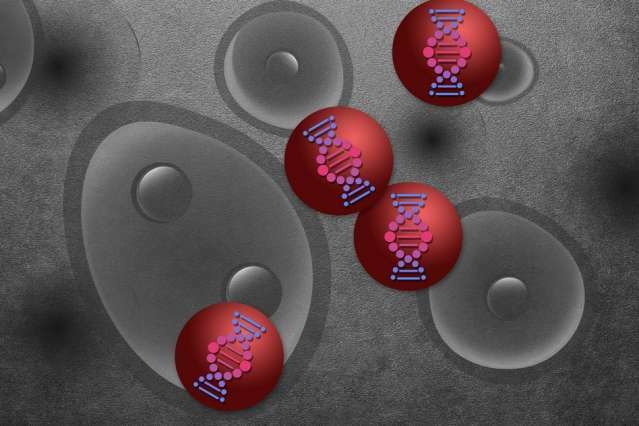 Finding a reliable way to deliver DNA to target cells could help scientists realize the potential of gene therapy—a method of treating diseases such as cystic fibrosis or hemophilia by delivering new genes that replace missing or defective versions. Another promising approach for new therapies is RNA interference, which can be used to turn off overactive genes by blocking them with short strands of RNA known as siRNA. To help evade these defenses, Anderson's lab has developed nanoparticles, including many made from fatty molecules called lipids, that protect genetic material and carry it to a particular destination. Many of these particles tend to accumulate in the liver, in part because the liver is responsible for filtering blood, but it has been more difficult to find particles that target other organs. "We've gotten good at delivering nanoparticles into certain tissues but not all of them," Anderson says. "We also haven't really figured out how the particles' chemistries influence targeting to different destinations." To identify promising candidates, Anderson's lab generates libraries of thousands of particles, by varying traits such as their size and chemical composition. Researchers then test the particles by placing them on a particular cell type, grown in a lab dish, to see if the particles can get into the cells. The best candidates are then tested in animals. However, this is a slow process and limits the number of particles that can be tried. "The problem we have is we can make a lot more nanoparticles than we can test," Anderson says. To overcome that hurdle, the researchers decided to add "barcodes," consisting of a DNA sequence of about 60 nucleotides, to each type of particle. After injecting the particles into an animal, the researchers can retrieve the DNA barcodes from different tissues and then sequence the barcodes to see which particles ended up where. "What it allows us to do is test many different nanoparticles at once inside a single animal," Dahlman says. Then, the researchers screened 30 different lipid nanoparticles that varied in one key trait—the structure of a component known as polyethylene glycol (PEG), a polymer often added to drugs to increase their longevity in the bloodstream. Lipid nanoparticles can also vary in their size and other aspects of their chemical composition. Victor Koteliansky, director of the Skoltech Center for Functional Genomics, described the technique as an "innovative" way to speed up the process of identifying promising nanoparticles to deliver RNA and DNA. "Finding a good particle is a very rare event, so you need to screen a lot of particles. This approach is faster and can give you a deeper understanding of where particles will go in the body," says Kotelianksy, who was not involved in the research. This type of screen could also be used to test other kinds of nanoparticles such as those made from polymers. "We're really hoping that other labs across the country and across the world will try our system to see if it works for them," Dahlman says.